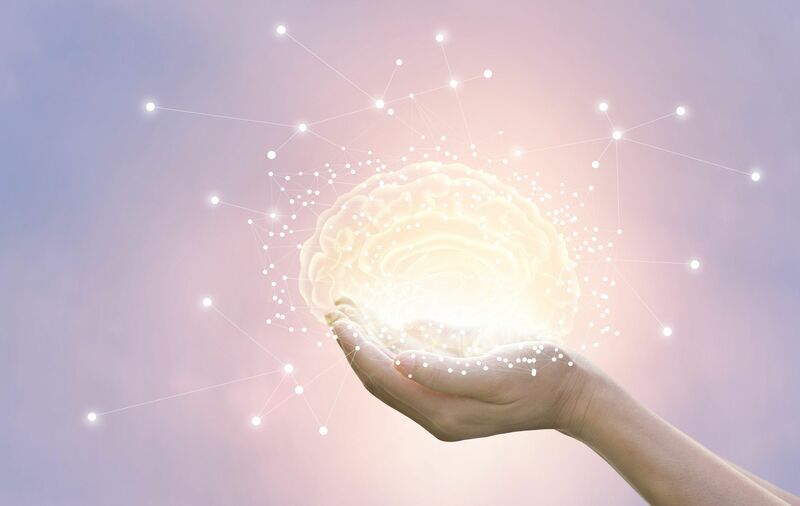 Teaching students about neuroplasticity and the brain’s potential can have a positive effect on their self-perceptions and expectations for success in school. Next, Dahl tells her students that when we learn, it’s important to connect new information with something we already know. She gives a couple of examples and then tells students they’ll be using pipe cleaners and sticky notes to make a model of a brain and what they are thinking and learning. 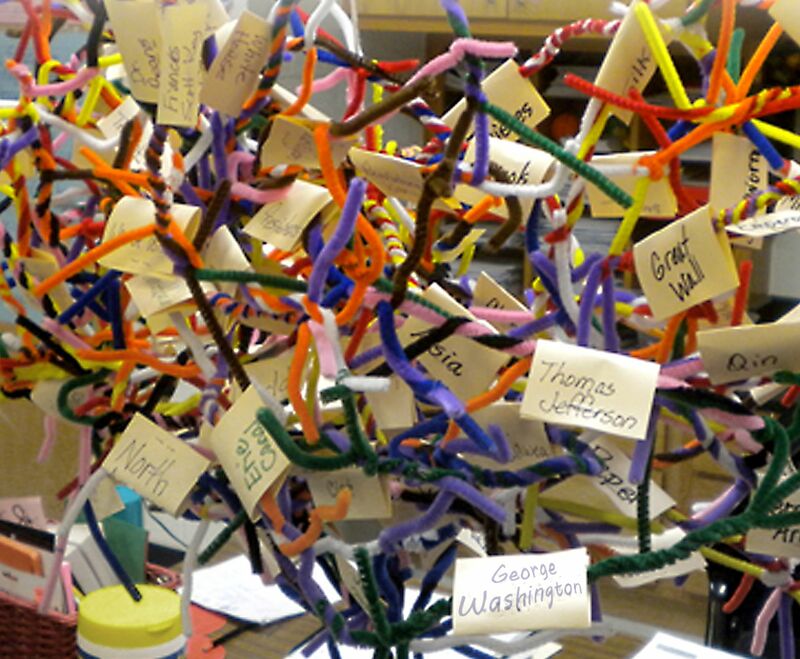 A class brain built by students reminds them of all that they’re learning. Students each get three pipe cleaners to twist together in the middle to represent the axon, leaving both ends untwisted to represent dendrites. They then work together to build the representational brain structure, connecting all the axons by twisting a dendrite from one neuron around the axon of another, with guidance from the teacher. The structure represents the class’s brain at the beginning of the school year. Throughout the school year, students create and add new axons to the brain, labeled with sticky notes describing new concepts they have learned. As the year progresses, the brain model gets more complicated, and it’s harder for second graders to add new axons (this might not be an issue for older students). At some point, I take over connecting the new axons. I write the labels myself so we can all keep track of the new learning that is added to the brain. We suspend the brain from the ceiling, but low enough that students can interact with it and read the labels. We choose a location away from busy traffic areas. Whenever possible, we discuss how new learning relates to other content. 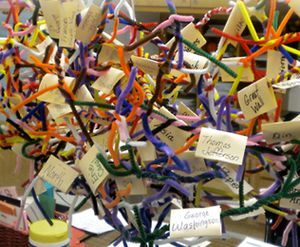 Some elementary teachers have students create their own individual models of a neuron that they can keep at their desk or take home as a reminder of their vast learning potential. We know from discussions with secondary teachers that their students are motivated to learn when they are taught that their brains change as they learn and that they can get functionally smarter. To teach this concept, teachers can draw a diagram of a neuron on the whiteboard to illustrate how synapses fire and form connections to other neurons in response to new experiences and learning. Georgia teacher Jeremy Green, another participant in our program, frames the need to be metacognitive about one’s learning by launching his AP psychology and U.S. history courses with a presentation on neuroplasticity, emphasizing that our brains can change and that we’re always getting smarter as long as we are learning. Green explains that he and his students talk about neuroplasticity early in the school year, discussing the idea that they’re not just what they are at present—that hard work plus the use of proven learning strategies will affect their academic success. He incorporates into his teaching the ideas that learning changes the brain and that students can become progressively functionally smarter by thinking about their thinking with the goal of improving how they learn. These concepts are new to many of his students and pave the way for cognitive and metacognitive strategies that Fitzgerald explicitly introduces and models as a way for them to succeed at school. More on these examples and a host of other related topics can be found in our book Teaching Students to Drive Their Brains, published with ASCD.